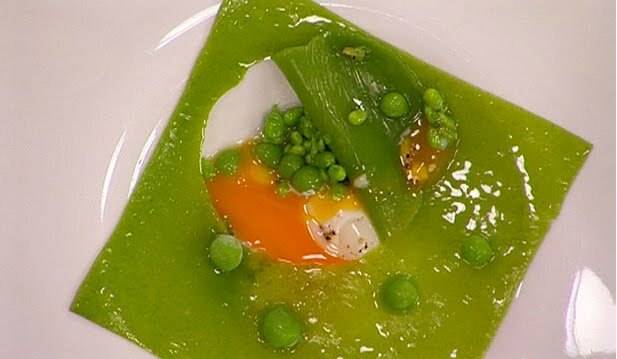 Hi-I think this has been the greenest thing ever made on MasterChef- no it’s NOT a green smoothie though it had potential. It’s Claire blending ice, cooked spinach, peas, salt and chicken stock for the gel layer in Adam Melonas’ Green Peas and Egg which involves nitrogen, a blast freezer and fake peas-yes those peas are fake! The finale of MasterChef is tonight – like millions of others I’ve been watching this every night but after a Masterclass a few weeks ago that prompted TodayTonight to call it The Cream and Butter Show I am over the TV food hype…and then George made a terrine on another night with a tiny sprig of green micro herb garnish on top of it and then said “You’ve got to eat your greens Gary!” Oh you have no idea George. Can you imagine his reaction to a green smoothie! I wonder if Coles had stocked up on butter before that Masterclass. On the menu- butter butter more butter and throw in some white flour sugar oil white rice meat and anyone for a triple bypass with that? OK I get that this is not supposed to be everyday food but do viewers get past the wow celeb chef factor and that this is not what real food is about? It’s all so complicated. MasterChef last year was widely praised for being so NICE and compassionate and getting people especially kids in the kitchen cooking and plating up like it was some new performance sport. They could have used the show and Masterclass to use cheap available ingredients to create something healthy fast and uncomplicated that would not require hours sourcing all the ingredients. Real food that is tasty and something that might inspire people to think Hey I can make this…but would it rate and get the same amount of viewers and advertising dollar? What happened to celebrating real food and the reasons why we eat and why? It’s The Gary and George Fat Chef Show…watching these celeb chefs on our screens showing us how it’s done and making this fat and salt laden food is normalising it….sad if this is the only way we think about food and eating. Viewers and ratings want celeb chefs and distorted fancy complicated food that barely covers the plate (always white and the food looks like a sample) and is plated up looking like an artwork with the main emphasis on appearance and then the balance of flavours…. Michelle the trainer from Biggest Loser was on Celeb MasterChef last year and lasted 1 show. She tried to cook healthy real food…no salt but still tasty…but George took one taste and his judgement? “needs salt…” and she was out. Skye from this year was widely criticised for making as her signature dish in the first episode a raw avocado chocolate mousse- and saying that she usually uses organic food. Twitter was going off that night with anti Skye comments. So the healthy foodies don’t last very long I get that….and when you have judges like George, Gary and Matt Preston with their salty fatty cooked food deadened fine dining palates you have no chance. So the question is would Coles or any other big food company still pay $3 million to advertise and have product placement on the show if the emphasis was on the MInimal and less on the Master? I was in Coles the other day and there’s some obvious in your face MasterChef promotion- every aisle has red MasterChef banners and end of aisle cards/recipes. While we are on Food/TV- Jamie Oliver’s Food Revolution USA started 2 weeks ago on Fridays ch 10-inspiring… Jamie Oliver takes on the fried processed food in school lunches in the US and tries to change the food culture in one of the USA’s most unhealthiest towns- don’t miss this. This is about real food and real cooking solutions to a major health problem. In the last ep- 6 year olds not being able to identify a tomato or potato…or any other vegetable- they know “ketchup/fries” but had no idea where they came from- sad…and all I keep thinking is green smoothies green smoothies! I love Masterchef….it has made me way more excited to be cooking in the kitchen…so it has worked for me…I understand there is butter butter and more butter however I think it encourages people to use a variety of foods and make an effort and involve the family in the food we eat. Also Garry and George are funny and it is good to see people on TV sharing their dreams and passions. A way better alternative than a TV show with people living in a house talking about crap and prancing around in front of the cameras ( Big Brother). It has also impacted my lunch breaks with a group of academics usually talking about the latest disease or treatment..now we are talking about the food we love and cook. The show is only in its second season so maybe with the stats on obesity, diabetes and heart disease on the rise maybe they will introduce health challenges etc…on that note….. I love Jamie Olivers food revolution show. Better go and serve the dinner …roast chicken with stuffed capsicums and lemon cake with too much butter eggs and sugar. The truth is I bet you I will not be eliminated tonight. Go Adam! and you didn’t think the green peas and egg was over the top? My blog started with the general lack of greens- and when they did do something green look what it was for!!! I could have written so much more about lack of fresh and raw. Everything cooked and overly processed. So there was some irony there about the green blender… I watch Masterchef on TV and read Twitter comments on phone at same time and very similiar views on there to mine…and yes Masterchef last year was exciting because new/different but this year people looking beyond the hype after that Masterclass and the Gary George celeb thing-and Julie Goodwin winning last year instead of Poh-not exactly your perfect role model for healthy eating I would say!! No they won’t ever be introducing health challenges because it won’t attract the same advertising levels and the judges obviously know nothing about nutrition…did you ever watch the MasterClasses on Biggest Loser? chalk and cheese- alternative ingredients and lots of fresh raw greens and superfoods like quinoa-and it gave people healthy tasty options- I was surprised- this was more inspiring to the general population I think to get in the kitchen and cook…but didn’t get Coles $3 million advertising dollar and the recipes at the end of the aisles and the ratings or the hype. Anyway…enjoy your dinner-the lemon cake sounds yummy-and yes go Adam!